If you have limited time in Vienna, make sure you visit at least these 3 places to feel the spirit of this beautiful city. A Vienna trip is never complete without a visit to Schonbrunn Palace. This Rococo style palace was used as Sisi’s summer residence. Now, this enchanting palace is UNESCO’s cultural heritage site. The vast, mesmerizing gardens and its splendid furnishings will succeed to impress you at first sight. When your eyes go in details, white porcelains, white-lacquered surfaces and gold leaves will also surround you with all the brilliance of Rococo style. Being one of the most popular tourist attraction in Vienna, The Schonbrunn Palace is attended more than 2 million visitors every year. In the complex, there are also the Tiergarten (the zoo that was founded in 1972), Palmenhaus (the greenhouse), Wüstenhausand (a desert botanical exhibit) and Wagenburg (a museum of carriages and vehicles that were used by the imperial household of the Austrian Empire). 08:30 to 17:00 in April, May and June. From 08:30 to 18:00 in July and August. From 08:30 to 17:00 in September and October. From 08:30 to 16:30 in November, December, January, February and March. Hofburg Palace was the principal winter residence of Habsburgs as Schonbrunn served as their summer residence. This lavish palace was the place from where Habsburg's empire was ruled for 7 centuries. Now, the palace is the official residence of Austrian President. The birthplace of Marie Antoinette and the official residence of Austria’s president, is one of the prominent landmarks of the city. In the palace, you will have the chance to visit the apartment of Sisi and the Ephesus Museum that displays the ruins of Ephesus as well as the collections from Egyptian, Near Eastern, Greek and Roman antiquities. The palace is open daily, including public holidays between 09:00 and 17:30 in September to June and between 09:00 and 18:00 in July and August. 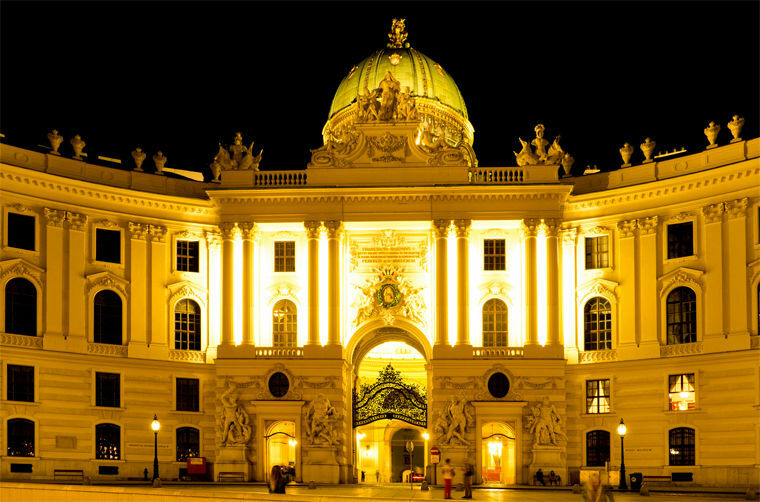 To have more information about how to reach there, you can visit the official website of The Hofburg Palace. The iconic landmark of Vienna, Belvedere Palace consists of 2 buildings which are Upper Belvedere and Lower Belvedere and these two buildings are connected to each other with a fascinating garden. This baroque palace has also rooms that are used as museums and in these museums display many highly remarkable paintings. From middle ages to the present, Belvedere houses Austrian art masterpieces such as from Waldmüller, Amerling, Fendi, Makart, Boeckl, Wotruba, Hausner, Schiele, Kokoschka, Hundertwasser and others. Upper Belvedere displays the largest collection of Gustav Klimt in the world including “The Kiss”and “Judith”. In Lower Belvedere, you can visit Prince Eugene’s apartments and for Belvedere's entire medieval art collection, you can head to Palace stables where once housed the best horses of the prince. To learn about how to reach Belvedere and the opening hours and to buy your tickets online you can visit the official website of Belvedere. Which One is More Tasty? Classical Music or Apple Strudel?